I recently got a new KitchenAid Mixer and I can’t find a reason on how I ever lived without it. It is the most wonderful addition to my kitchen and I have used it more than I imagined. 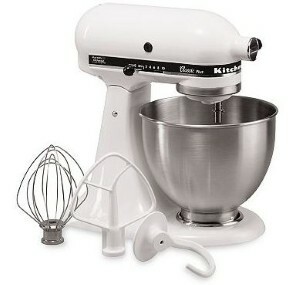 Tonight we will be drawing a winner of the KitchenAid Mixer in our huge Blue Kangaroo Giveaway! Be sure you get your entries in now! That is it! After you complete those steps you are eligible to win the KitchenAid Mixer above and don’t forget about the Dyson we’ll be drawing a winner for the in the next few days! There’s also an awesome Internship up for grabs. Could you use $200 extra a week working from home part-time?